Learn the proper way to jump start your car in case of a breakdown. Almost everyone who owns a car knows first-hand about how much of a bummer it is when you have a dead battery. That awful starter click coupled with silence from the engine is not what you want to hear at any time. But you’ve found yourself in this situation and in a rush to get someplace. So what do you do? The simple thing to do would be to walk back into your home and call a cab. But cabs can be expensive and are never guaranteed to be on-time. You need your car now. If you’re in this situation, you can always jump start your car with cables and the help of a good Samaritan with a working car battery. Find someone with jumper cables (if you do not have some) and/or is willing to let you use their car as a power source. Take out your key from the ignition, or ensure your wireless fob is far enough away from your car. Set the parking brake on both vehicles. Turn off radios, satellites, GPS, etc. Anything with a battery or on/off switch should be in the off position. Open the hood of both cars and locate the batteries. Attach the positive (red) clamp to the positive terminal of the dead battery. Then connect the other end of the positive (red) clamp to the positive terminal of the working battery. Connect one end of the negative (black) clamp to the negative terminal of the working battery. Then attach the other end of the negative (black) battery to another metal area on the engine of the car with the dead battery. The area you place the other end of the negative battery on should be located as far away from the battery as possible. Try to turn the car with the dead battery on. If the car with the dead battery isn’t starting, stop cranking and turn the car with the working battery on, too. 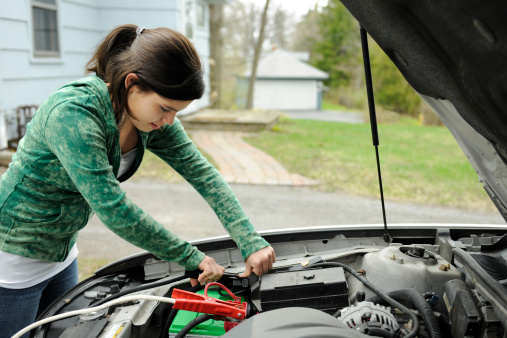 Once the car with the working battery is started, attempt to turn the ignition of the car with the dead battery. 10. Allow car to idle for a few minutes before removing jumper cables from the cars. Remove the cables in reverse order from when you attached them to your car. As soon as possible, get your car to an experienced mechanic. They can tell you if you need a new battery, replace it if you do or find out if there’s another reason your battery lost a charge (like a bad alternator). Good luck!